Thank for dropping in to my website. 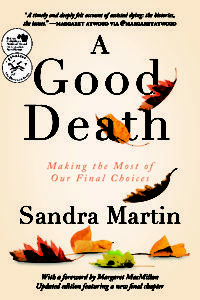 If you have been here before you are probably used to reading news and articles about my book, A Good Death, a social history of the right to die movement in Canada and around the world. I’m still writing about medically assisted death, but I am also interested in aging. We begin aging at conception, perhaps sooner, and most of us want to extend that process through long, healthy and productive lives. How do we do that? What do we mean by old in an era when three score years and ten has lost its resonance as longevity soars and centenarians are the fastest growing demographic in Canada? I don’t write many obituaries these days, but I made an exception for Allan MacDougall, co-founder of Raincoast and the Canadian publisher of Harry Potter. I tumbled on a sidewalk in Toronto and broke my shoulder–three weeks before my daughter’s wedding. My confidence took as much of a hit as my body, so I resolved I was done with falling. Here’s what I learned. Of course, I still write about death and dying. Here’s a piece I wrote for U of T Medicine explaining why many doctors will not want to provide MAiD for patients with advanced dementia, even if the law allows it. I’d like to tell you some good news about A Good Death. There are more details on other pages, but here are some highlights. The paperback of A Good Death arrived in bookstores in early May, 2017. I have updated the first chapter and added a new one, “So Close and Yet So Far.” I write about the government’s Medical Assistance in Dying law, why it fails to comply with the Supreme Court decision in Carter, and what needs to be changed in the best interests of patients. We still have a long way to go in ensuring our final human right: choice in the way we die. 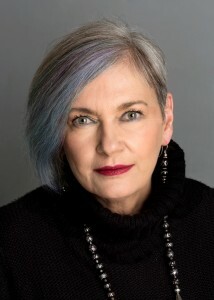 A Good Death won the British Columbia National Prize for Non-Fiction in January, 2017. I delivered the Pelham Edgar Lecture at Victoria College in the University of Toronto in February. A Good Death was a finalist for the J.W. Dafoe Book Prize in March and the Donner Prize in Public Policy in April. Philosopher Wayne Sumner and I talked about some of the ongoing problems with Medically Assisted Death in the Literary Review of Canada. Three years after The Supreme Court Decision that legalized Medically Assisted Death, a retrospective look at what we have accomplished and how much we still have to do. CPAC interviewed me for a Right to Die documentary as part of its Pillars of Democracy series. Should terminally ill prisoners be entitled to ask for an assisted death? Did Adam Maier-Clayton need to kill himself? Here’s a brief introduction to the hardcover of A Good Death. A Good Death asks the tough question none of us can avoid: How do we want to die? The answer will change your life—and your death. Tks for writing Marianne. I am sorry to hear of your mother’s condition. The parliamentary committee recommended that people, who are diagnosed with a grievous illness such as dementia, should be able to swear an advance care directive about their end of life wishes while they are still competent. I suspect that would not help your mother becasue it sounds as though she is no longer competent, but it could help you and many others who may be diagnosed with dementia in the future. The proposed legislation does not include a provision about advance care directibves. Instead, it proposes that the legislation, if passed, should be reviewed in five years time to determine if advance care directives should be included. I worry that five years is a very long time for suffering people to wait, that there will be an election in the meantime and a possible change of government. What guarantee do we have that a future government will review the legislation? That is one of the reasons why I think we need to contact our politicians now about strenghthening the legislation to ensure that it meets the criteria established by the Supreme Court in the Carter decision and that it includes the recommendations of the government’s own parliamentary committee. Looking forward the reading but so far my impression is that A Good Death would be great in an applied ethics or biomedical ethics course. Many years ago I taught the subject. Sandra’s point that we should have conversations about end of life wants and wishes may be more challenging than a university course. I finished A Good Death Sunday and have taken a couple of days to reflect on my reaction to the book and more importantly the government’s botched attempt to properly legitimate this crucial matter. Through our past communications you are well aware of my situation and opinion but I must thank you wholeheartedly for two very crucial things your book does. First you present a very rational and calm discussion on a subject that is too often freighted with irrational emotions. Second, and most importantly to me, you highlight through many cases just how devastating and misunderstood the impact of debilitating neurodegenerative diseases like MS can be. Your book should be required reading for all MPs but particularly our cabinet ministers.